I haven't posted one of these in a while. Not because I haven't been cooking, but because I haven't been photographing my cooking adventures. This house is really hard to take photos in, because the walls are sort of a green color, and makes everything a weird shade of yellow green, so I have had to play around until I finally found a place where I can take decent food photos. This is actually a mash of the last 3 weeks of cooking, because I didn't make everything on the list each week, but these were delicious and I enjoyed eating each one. Hopefully this will give you some ideas of delicious things you can make with your family! Some of them were really quick and easy. White Bean and Bacon Soup (vegetarian if you leave out the bacon) - I had made this in the past, and hadn't loved it, but then I made it again last week, and totally fell in love with it. Even Fox ate it just fine (the bacon helped...). 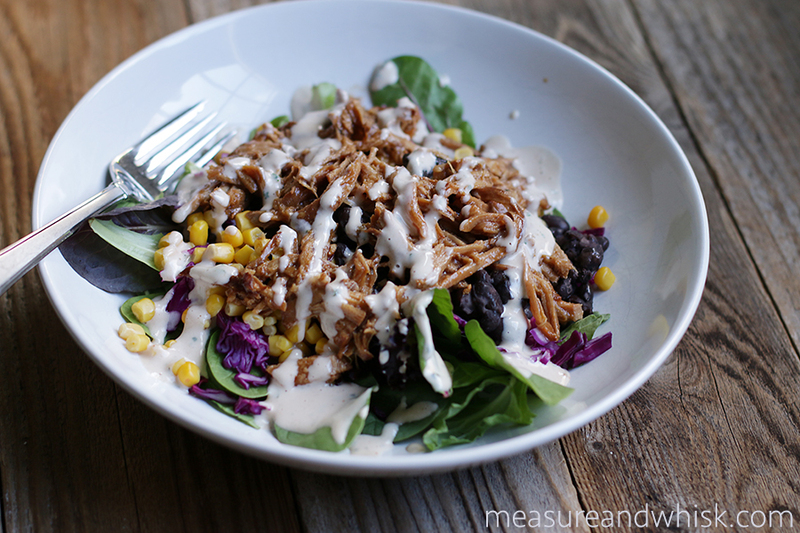 BBQ Chicken Salad (make some ahead of time) - I used a BBQ pulled pork on this, and it was delicious. I love the dressing and having so many veggies in a meal. Ramen Cabbage Salad (vegetarian, vegan, 30 minute meal) - This is one of the cheapest meals you can make. I keep a few Asian kitchen staples around (like sesame oil, rice vinegar and soy sauce), so I can make this most anytime. It is delicious and super easy. And Fox loved dipping the noodles in the sauce. Broccoli Potato Soup (vegetarian, vegan) - Nice and hearty for a cold night. Pesto Pasta with Peppers and Onions (vegetarian, 30 minute meal) - I LOVE this dish. It is so good and really filling. The pesto in the sauce is a win for sure. Sundried tomato soup (vegetarian) - A classic in our house. Serve it with toast, and everyone goes wild. Vegetable Lasagna (vegetarian) - Not the most amazing lasagna I have ever had, but it was pretty decent. I love a good melted cheese on top.